This article originally appeared in the Winter 2010 issue of Queen’s Quarterly, a journal published by Queen’s University in Kingston, Canada. We could begin in the sprawling barrios of Caracas. Venezuela’s capital is a troubled city: congested, polluted, crime-ridden and corrupt. Guns and drugs are widespread; murder is common. Some neighbourhoods lack schools, public transit, policing and basic sanitation. At night residents stay indoors to avoid the warfare of rival gangs. Even the city’s elite are fearful: constantly in danger of kidnapping, they live behind the locked gates of their homes and country clubs. Are things getting better or worse? In a political culture bitterly divided into pro- and anti-Chávez factions, the answer depends on whom you ask. Or we could begin at Toronto’s sleekly modern opera house, the Four Seasons Centre for the Performing Arts. There, on October 26, 2009, I heard a massive 200-piece orchestra give a brilliant concert that culminated in an over-the-top rendition of Tchaikovsky’s Symphony No. 4. The performance was impressive by professional standards – but, astoundingly, this was an amateur youth orchestra, the Orquesta Sinfónica Símon Bolívar. The average age of the musicians looked to be about 20, and most of them are from the poorer parts of Venezuela’s cities and towns. But perhaps we should begin with the man at the nexus of the seemingly unconnected worlds of classical music and anti-poverty activism: José Antonio Abreu. Without him, there would be nothing to write about here. At 71, Abreu’s bronze complexion, slight frame and bald pate give him a Gandhi-esque aspect. And there are other noteworthy points of comparison to the Mahatma: a beatific humility, a deep commitment to social justice, charismatic powers of persuasion, and a determined patience that has kept him on a steady course for decades. He was born in the city of Valera, in 1939, into a prosperous family. Upon completing a PhD in economics in Venezuela, he furthered his studies at the University of Michigan. He’s been involved in politics, as a deputy in the Venezuelan Congress, and briefly served as Venezuela’s Minister of Culture. He has also taught economics and law in several universities. Parallel to his “official” career is a lifelong commitment to music: he studied piano, organ and composition at a conservatory in Caracas, and won awards for his musical ability. Yet even the ever-optimistic founder of El Sistema might not have predicted the astonishing growth of his initiative. His one small orchestra has grown into an enormous nation-wide network of 125 youth orchestras, as well as choirs, folk-music ensembles and instrument-building workshops, in “núcleos” throughout Venezuela. An estimated 400,000 children have passed through the program. The orchestras are organized in a pyramidal structure: as students improve, they move up to a better orchestra. With so much talent to draw upon, it’s no wonder that the ensemble at the top of the pyramid, the Símon Bolívar Orchestra, is one of the best youth orchestras in the world. Perhaps the most impressive graduate of El Sistema is Gustavo Dudamel. Born in 1981 into a musical family in Barquisimeto, he entered the program as a child, and took up conducting at the age of 16. In 1999 he became conductor of the Símon Bolívar Orchestra, and seven years later made the leap to Europe, where was appointed music director of the Gothenborg Orchestra in Sweden. In 2009 he was named as music director of the Los Angeles Philharmonic. Not yet 30, he is the youngest conductor of a major American orchestra – and is a very convincing advocate for El Sistema. Not surprisingly, Abreu’s success has been much applauded. To journalists, poor kids from Latin America playing classical music is a “man-bites-dog” story, and the New York Times, the Times of London and the CBS television program Sixty Minutes have all lavished praise on Abreu and El Sistema. Even in the most prestigious classical musicians in the world have paid their respects: following a trip to Caracas, Sir Simon Rattle, conductor of the Berlin Philharmonic, announced, “there is no more important work being done in music now than what is being done in Veneuela.” In 2008 Abreu was the recipient of Canada’s Glenn Gould Prize (which led to the Símon Bolívar Orchestra’s 2009 appearance at Toronto’s opera house.) Abreu used the $50,000 cash prize to buy more musical instruments for his students. As news of Abreu’s achievements has spread far and wide, what started out as a purely Venezuelan endeavour took the international classical music world by storm. Music teachers absorb his every word – as they did in at a conference at Toronto’s Royal Conservatory of Music, where he spoke in 2009 – eager to adapt his ideas to their own communities. One of the most successful Abreu-inspired programs outside Venezuela is Sistema Scotland, based in the town of Stirling, and similar initiatives have sprouted in about two dozen countries around the world. In the United States there are programs in several cities, including New York, Baltimore and Los Angeles; and Boston’s New England Conservatory of Music has created El Sistema USA, a course of study designed to teach educators how to establish núcleos in their communities. Here in Canada, there’s a Sistema-inspired program in Ottawa called the Leading Note Foundation, and another in Moncton run by the New Brunswick Youth Orchestra. El Sistema has emerged as a knight in shining armour, a gathering snowball, and an idea whose time has come. Its bright glow of hope, glory and sheer goodness is blinding – so blinding that it makes a critical perspective difficult to achieve. 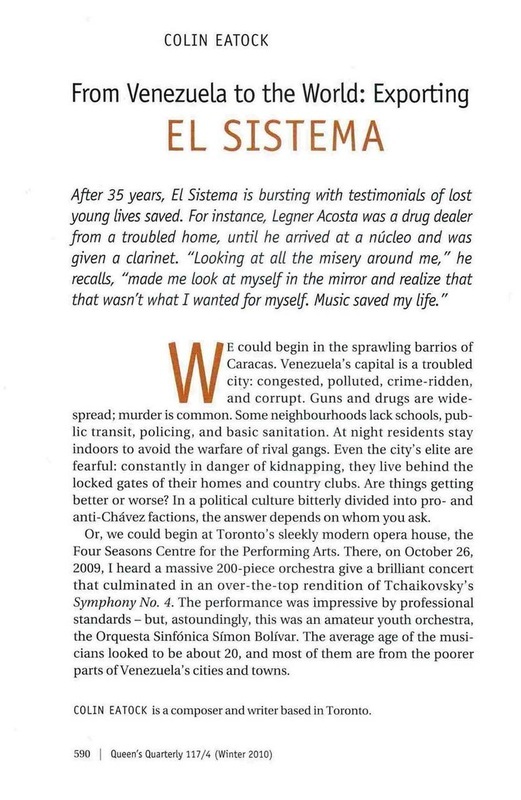 Indeed, El Sistema’s successes are so dramatic and its message is so inspiring that probing questions rarely asked about it. So let’s ask a few. Why employ music in the fight against poverty? And what is it about classical music per se that makes it a useful tool? What do people in the education and social-work professions think of El Sistema? And can El Sistema be successfully “franchised” in North America? These are broad questions – but let’s begin with something more tightly focused: Why did the New England Conservatory feel called upon to establish El Sistema USA? “The fact that this is happening at the New England Conservatory speaks to a desire to rethink traditional music education,” says Mark Churchill, director of El Sistema USA, on the phone from Boston. He also points out the NEC has an ongoing relationship with Abreu and his work in Venezuela: in 2000 the conservatory worked with Abreu to create the Youth Orchestra of the Americas, and awarded him an honorary doctorate two years later. In 2007 the NEC sponsored the Símon Bolívar Orchestra’s first major tour of the United States. “El Sistema USA is still getting started,” Churchill explains. “It’s a national service organization: we offer support through training, advocacy and public relations. Our job is to try to build an awareness of what El Sistema is, and how it can serve everyone.” Churchill’s trips to Venezuela, where he has heard and seen what has been accomplished in the núcleos, have made him a committed supporter of Abreu and his methods. The New England Conservatory has just graduated its first crop of “Abreu Fellows”: ten music educators who have quickly found jobs across the USA. One of them is the 27-year-old Ottawa-born Dantes Rameau, who has accepted a position with the Atlanta Music Project, a new program in Georgia. His new job takes him into a mixed-income neighbourhood where, as he puts it, “there’s a problem with high-school graduation.” He too has seen what has been accomplished in Venezuela, and he’s optimistic that El Sistema can be made to work in North America. Music becomes a source for developing dimensions of the human being thus elevating the spirit and leading man to a full development of his personality. So the emotional and intellectual profits are huge: the acquisition of leadership, teaching and training principles; the sense of commitment, responsibility, generosity and dedication to others; and the individual contribution to achieve collective goals. All this leads to the development of self-esteem and confidence. But why the emphasis on classical music? It’s true that El Sistema also includes a program for traditional Venezuelan folk-music (the Folklórico ensemble performed at the Royal Conservatory during Abreu’s visit to Toronto). But classical music is what El Sistema is famous for, and why it has turned heads in the musical world. Yet classical music may suit Abreu’s purposes for other reasons as well. For one thing, the high level of respect traditionally accorded to this music makes it a useful stepping-stone for social advancement. Classical music is an ideal entrée into the bourgeois world – and Abreu makes no apologies for using it as tool to help lower-class children acquire middle-class values. On the contrary, that’s his goal. And there are other critics. In an interview in 2007, the El Sistema-trained conductor David Lopez questioned the program’s emphasis on classical music, which, he noted, is not a kind of music that allows much scope for individual creativity. [note 1] As well, he’s concerned about over-rigorous instruction methods and the limited professional opportunities available to classical musicians today. “Why do we need three million more musicians?” he asks. In the future, it’s likely that there will be more debates in professional circles about the merits of El Sistema. But at this time, most núcleos in Canada and the USA are in their infancy, and many people involved in education and social work (who don’t also have an interest in music) know very little about the program. “We’re just starting to have conversations with those communities,” says Churchill. “We’re beginning to link with social service organizations. But I can’t really say much about that yet.” El Sistema’s insular status – famous in the classical music world, but relatively unknown outside it – is a concern to Churchill, who hopes to attract the support of educational foundations and government agencies. It’s possible that El Sistema will turn out to be little more than a passing educational fad. And it’s also possible that, in some cases, the motives of El Sistema’s supporters may not be entirely altruistic. These days, classical music is struggling with its own problems: declining popularity and a growing sense that the art form has lost its relevance. 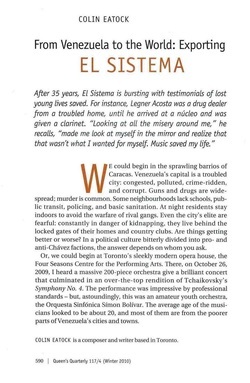 Some musicians (such as Simon Rattle) aren’t adverse to hoping that El Sistema could provide the shot in the arm that classical music needs. That’s what has already happened in Venezuela: El Sistema has spawned a burgeoning interest in classical music, and professional orchestras have sprouted all over the country. It’s said that even in the barrios, where most of Abreu’s kids come from, half of the pirated CDs sold by street vendors are classical CDs. Are El Sistema’s cheerleaders interested in what classical music can do for the social justice movement, or in what the social justice movement can do for classical music? Perhaps the two goals are complementary rather than contradictory: altruism and self-interest can be a powerful combination, and this confluence of forces may be just what’s needed to help El Sistema accomplish things in Canada and the United States. Time will tell what results emerge from El Sistema in North America – but to Abreu and his followers, the sky’s the limit. 1. Chang, Jennifer Diana Mei-Lyn, Orchestrating an Affluence of Spirit: Addressing Self-Esteem in Impoverished Venezuelan Children Through Music Education (Presented at Harvard College, 2007), pp. 100-103.